We've shared the amazing Talloula wedding venue with you on the blog before, and with it's contemporary style and clean palettes, the venue has gone from strength to strength since it opened. What we love about Talloula is how the owners use the venue to it's full advantage, making use of their Treat Cafe for high teas, and use the large reception area for Christmas fairs and workshops. Talloula has become a beautiful creative space, and the 18 May is going to be no exception, when they hold the Autumn edition of "Talloula's Wedding Favourites". In a nutshell, this event is a going to be a celebration of all things wedding. It will be a creative ideas workshop packed with wedding planning tips and decor trends, with talks from professional wedding suppliers on different must-know topics. The workshop will be complete with champagne and a yummy canape style lunch, coffee and cupcakes. Best of all, some of KZN's top wedding suppliers will be there - and we were so honoured that Talloula asked us to be a part of this event! Ruby + Swallow will be there displaying a selection of our wedding stationery. 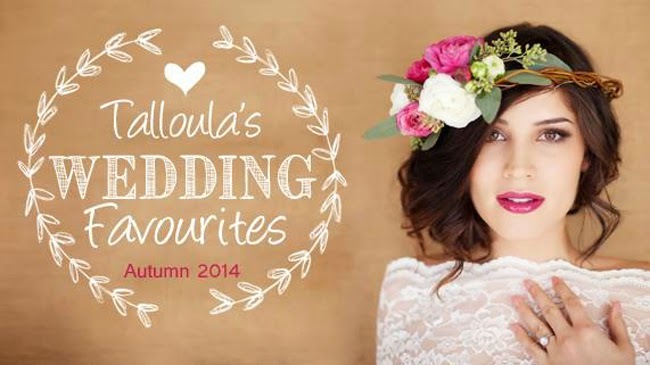 Talloula wants every bride to leave the workshop fully equipped to plan their own weddings, and we have no doubt that it will be full of amazing wedding tips! The day will be a feast for the eyes with beautiful flowers and creative ideas in every corner. There will be wedding entertainers as well, but the most exciting news - each bride will leave with a goodie bag full of treats from the suppliers. Who doesn't love a goodie bag?! Bring along your bridesmaids and moms, and there is even a special line up for the grooms, including how to write your grooms speech. It's going to be an absolutely awesome day - we hope to see many of you there!